Activision’s action adventure game, Skylanders Battlegrounds has dropped it’s price tag on iOS. The game lets you play with two Skylanders at the same time, and take on Kaos’ evil Warlord Army. There are four warlords in the game: Arbor Eater, Mega Chompulon, Chompy Mage, and King Brock.The Skylanders can be upgraded with various abilities, which you can unlock. You can also equip them with various weapons to make them more powerful. There are 30 Game Center Achievements for you to unlock. The game weighs a massive 584 MB, and requires an iPhone, iPad, or iPod touch with iOS 5.1 or later. Despite being a premium game, it has optional In App Purchases for Gems. 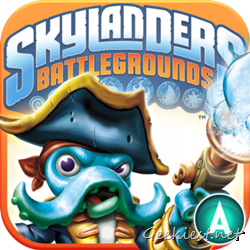 Skylanders Battlegrounds normally costs $6.99, but you can get it for Free for a limited time from the Apple iTunes Store.